I’ve been in the market for a new camera bag for the past couple months. I have very specific needs in a bag that I don’t think others really have. Since, as a travel photographer, I’m on the road 365 days a year, I can’t really have a bag that’s just for camera gear. And with so much camera gear, I can’t have a bag that’s just got a small amount of space for equipment. The problem with most camera bags on the market these days is that they are either entirely for camera gear, or they are tiny little bags for going on a casual shoot. In the end, I found the Naneu Bags Outlander 50L which seems to be as versatile as they come. 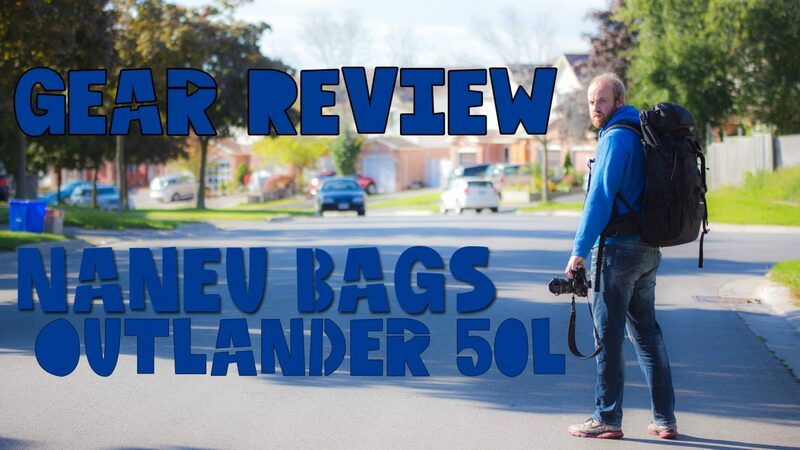 You can check out my video review of the bag, or read about it below. 50 liter capacity without the camera pouch inserted. Dimensions are 70cm tall, 32cm wide, and 22cm deep. Tripod strap attached to the back of the bag. In sum, the bag is exactly what I was looking for with a few exceptions. There are few bags on the market that really have the amount of space that this bag does. It carries a body, up to 4 lenses and probably a flash or two, as well as having a tonne of room in the top section for other things. There are few bags on the market that offer that type of flexibility which is why it is a perfect bag for those who are planning on doing some backpacking and want to pack everything away into one bag. My only major qualms with the bag is that there are no pouches or pockets in the upper compartment. Essentially, it’s just a top loaded system like an old-school backpacking bag. I would have really appreciated some pouches with zippers or velcro attached so that I could put my filters, extra batteries, cables, and that sort of thing in them without them getting all tangled and messed up. Instead, I’m going to have to buy a small accessories bag to house them in. I might actually even put some velcro in there myself and vecro in some sort of insert. We’ll see. However, it would have been so much nicer had it had these pouch areas already. That said, the Overlander 50L really is the perfect bag for travelling photographers. In fact, I would argue that if you were planning on doing a trip up to 1 month, you could likely do it entirely just using this bag. If you’re in the market for a new bag, even if this one in particular doesn’t really work for you, you can check out the other gear that Naneu is putting out on the market here. I’ve got a bunch more new gear, so there will be a couple more reviews on the way. I’ll be talking about some storage solutions for photographers, and I’ll be reviewing things like a TriggerTrap and an Epiphanie Designer Camera Sidebag for men. Of course, there’s lots of travel up coming as well. Next week, I’ll be taking the VIA Rail across Canada to the Canadian Rockies!